Has Mara Kint figured out how to save herself? Is the Reverie TV show cancelled or renewed for a second season on NBC? The television vulture is watching all the latest cancellation and renewal news, so this page is the place to track the status of Reverie season two. Bookmark it, or subscribe for the latest updates. Remember, the television vulture is watching your shows. Are you? 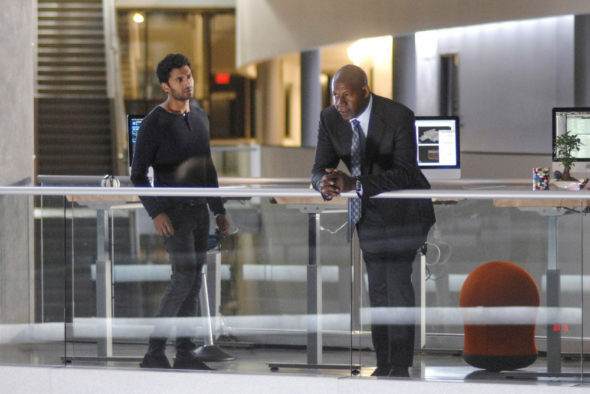 An NBC techno-thriller, Reverie stars Sarah Shahi, Dennis Haysbert, Sendhil Ramamurthy, Jessica Lu, Kathryn Morris, and John Fletcher. The drama centers on human behavior expert Mara Kint (Shahi), who retired from her career as a hostage negotiator, after a personal tragedy. Her old boss, Charlie Ventana (Haysbert), has now tapped Mara for a mission to save regular people who have essentially lost themselves in an immersive virtual-reality experience, which lets them live out their wildest fantasies and most dearly held dreams. The first season of Reverie on NBC averaged a 0.44 rating in the 18-49 demographic and 2.10 million viewers. Find out how Reverie stacks up against other NBC TV shows. Reverie has been cancelled so there won’t be a second season. Could it be revived someday? Stay tuned for further updates. Will NBC cancel or renew Reverie for season two? The ratings were terrible right out of the gate so I’m sure that this series will be cancelled. I’ll update this page with breaking developments. Subscribe for Reverie cancellation or renewal alerts. 11/7/18 update: NBC has cancelled Reverie so there won’t be a second season. Details here. TV show ratings are still important. Follow Reverie‘s weekly ups and downs. Find more Reverie TV series news or other NBC TV show news. What do you think? Were you hoping that the Reverie TV show would be renewed for season two? Are you sorry that NBC cancelled this TV series, instead? Please don’t cancel this wonderful show Pllllllease bring reverie back!!!!!!!! Please bring back Reverie. It has great potentials. Actors are very likable. I love syfi programs . I thought Reviere had great potential if it could get a fair start. Another good show bites the dust! Please any tv station pick up this show it was really good. Please don’t cancel this show. I stayed up late on work days to watch and tweet about reverie! Pllllllease bring reverie back!!!!!!!! Pleeeasse bring Reverie back!!!!!! Don’t cancel this show! I love it. I stayed up late on work days to watch this show. Can’t live without it! This virtual reality thing did not work for me. By staring at an IPad and muttering some silly phrase? The writers FAILED to incorporate virtual reality by not incorporating the virtual reality headset in some way, as we all can relate. If it does not come back, no great loss. Renew reverie!!!! I love this show! I stayed up late on workdays watching it and texting about it! I love reverie! Keep it, keep it, keep it!!! SO TIRED of the same old tv, hospital, cop, and reality shows. This is something different.